Square Tube is widely used in frame work and, depending upon the metal, for a broad range of other purposes. Aluminum and steel square tube is easy to weld, cut, and machine, with stainless steel square tube having easy welding and moderate cutting, forming, and machinability. Square tube is available in many stock lengths ranging from 2 feet to 24 feet, or custom cut to size with no minimum purchase required. Aluminum Square Tube is used when light weight and corrosion resistance are important. 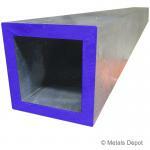 With inside and outside square corners, there are no visible weld seams. Easy to weld, cut, form, and machine, aluminum square tube is widely used in frame work, support columns, gates, fencing and handrails. 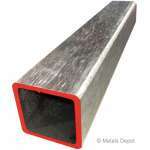 Shop for Aluminum Square Tube Online! 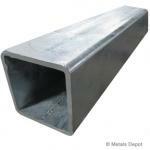 Shop for Galvanized Square & Rectangle Tube Online! Stainless Steel Square Tube has inside and outside radius corners and a protruding interior weld seam. It is most frequently used when greater strength and strong corrosion resistance are needed. Its durable mill finish withstands the elements well including - chemicals, acid, fresh water, and salt water, Stainless square tube is ideal for many applications such as frame work, supports and braces. Shop for 304 Stainless Steel Square Tube Online! Shop for Polished Stainless Square Tube Online! Steel Square Tube with interior and exterior radius corners and an interior weld seam is an economical choice for many fabrication projects. Easy to weld, cut, form, and machine. It is frequently used in frames, roll cages, truck racks, trailers, and railings. 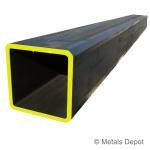 Shop for Square Steel Tube Online!